In this work, we apply the Stochastic Grid Bundling Method (SGBM) to numerically solve backward stochastic differential equations. The SGBM algorithm is based on conditional expectations approximation by means of bundling of Monte Carlo sample paths and a local regress-later regression within each bundle. The basic algorithm for solving backward stochastic differential equations will be introduced and an upper error bound is established for the local regression. A full error analysis is also conducted for the explicit version of our algorithm and numerical experiments are performed to demonstrate various properties of our algorithm. Chau, K.W, & Oosterlee, C.W. (2018). 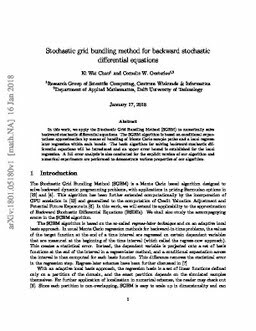 Stochastic grid bundling method for backward stochastic differential equations. arXiv.org e-Print archive.